In this modern world, young women are often faced with the contradictory demands of a flourishing career and ticking biological clock, especially if you're employed by a prestigious Silicon Valley giant. In an effort to recognize the personal challenges this presents, Apple and Facebook say they offer coverage to female employees who wish to freeze their eggs to delay parenthood to a later time. A spokesperson for Facebook told CBS News the company added egg-freezing to their arsenal of family planning and fertility benefits in January 2014. The company covers up to $20,000 for this procedure, regardless of whether it's deemed medically necessary or not. Prior to 2014, Facebook covered the cost of sperm donation, surrogacy and adoption support, and new moms and dads are allowed up to four months of paid leave. Facebook employees receive their medical benefits through Aetna Health Insurance Company. Apple told NBC News that they will make this benefit available to employees as of January 2015. Dr. Alan Copperman, director of the division of reproductive endocrinology and infertility at Mount Sinai Hospital in New York City, told CBS News that freezing eggs has fast become a common way to handle this post-feminist fertility conundrum, and many young and single women even support each other by visiting clinics together for the procedure. "More companies are going to be offering it to their young female employees for their advantages of attaining young talented female employees," said Copperman. CNET's Dan Ackerman agrees that's a priority in the tech industry. "I think it's part of a larger trend of trying to appeal more to female employees," he said. "If you look at Facebook and Apple, they're both about 70 percent male.... I think it's part of a bigger cultural play where they're trying to make the industry much more appealing." This benefit may also reflect the fact that employees at both tech giants tend to be relatively young by workplace standards, though at an optimal reproductive age. A report from PayScale, which provides data on company culture and salaries at top employers, the median age of Facebook employees is 26, while at Apple the median age is 33. Medically, a woman is at her reproductive prime between the ages of 16 to 28. Freezing their eggs may allow women who wish to put parenthood on hold avoid age-related fertility problems, which come with more costly and less successful treatment options. 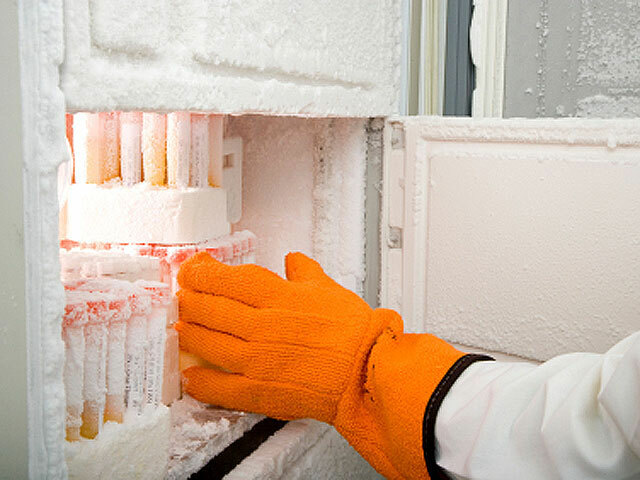 Egg-freezing costs about $10,000, though a second round may be necessary in order to collect enough viable eggs for storage and later use. Copperman said the pregnancy success rate for frozen eggs ultimately depends on the age of woman when she opts to ice them, as well as the overall health of her eggs. With a 32-year-old woman's eggs, the pregnancy success rate is about 50 percent. This ultimately means a woman is best off utilizing this technology as young as possible if she knows she'll want to eventually become a mother. In general, the younger a woman is when she stows the eggs, the more likely she'll conceive after implantation. "Facebook and Apple are ahead of the game in providing their reproductive age female employees with the option to preserve their fertility," said Copperman. "While there is no guarantee that the eggs retrieved will be normal or will survive freezing, thawing, fertilization, and implantation, elective egg-freezing has the potential to help many women ultimately have the families of their dreams."